"O God, give me souls or I die!" John Hyde's prayer life ranks in a league with the prayer lives of men like Andrew Murray, George Mueller, Charles Finney, and Rees Howells. Draw near to brother Hyde's prayer closet and you will see the tears coursing down his face-and hear the groaning and sobs as he pleads, "O God, give me souls or I die!" And indeed the Lord did-thousands of them. If you want to pray effectively, you can do with no better example than to read the life of John Hyde. John Hyde was born in 1865 in Carthage, Illinois. His father was Rev Smith Harris Hyde a Presbyterian. John and his brother Edmund attended seminary together. John looked up to and admired his older brother very much. Edmund had his sights on becoming a missionary but suddenly died. This tragic event brought John to a place of heart searching. He had lost his brother who he had looked up to for direction and stability. This brought John to a turning place, a place of decision in his life. How many of us have come to tragic events in our lives? What was our response to them? Did we continue on or did we give up? John did some major heart searching and turned himself to God in prayer. It was during this time of seeking God in prayer that John surrendered himself to the call to become a missionary himself like his brother Edmund. All of us must start our walk in the same place. It is the place of surrender. It is the place where we say, "Father, if thou be willing, remove this cup from me: nevertheless not my will but thine be done" (Luke 22:42). John then made a decision. If I am to be a missionary then why not be a great one. Once submission was made to the will of God, John decided to commit himself to God's call. He applied himself in study and prayer. This is one of the most important times in the lives of those who choose to pursue their destines in the Lord. Study and prayer are the foundations of all great ministries (2 Tim 2:15). This precious time of preparation is never wasted and for John it was no different. He was a good student and applied himself with great diligence. It seemed the more he gave himself to prayer, the clearer and greater his vision became. The call of God and the vision is one of the most important things that must become rock solid in God's ministers. It is the call that gets one through the most darkened nights. It is the 'knowing' deep inside that carries one through the times of walking alone. John felt a strong calling to the nation of India and began to spend hours in an attempt to learn the local language. Then the day came. It was in 1892 that he boarded a steamer in New York bound for the nation of India. On the Ship John received a letter from a close friend of his and family saying, "I will not cease praying for you until you be filled with the Holy Spirit." John's response was one of heated anger. How dare the suggestion that he was not filled or equipped for his call. After all he had received a B.A. degree, studied the language, was even on the way and was determined to pursue his destiny. How many times in our lives does God send us a message that seems to permeate every fiber of our being? For John, just leaving his family, anxiously ready to begin to do what he had so desperately waited to start. But now, on his way, he is challenged by the Word of the Lord. John threw the letter in the trash and angrily walked out of the room. But walking the decks of the ship he continued to be challenged by the prodding thoughts that he must be filled with Holy Ghost power (Acts 1:8). After much soul searching, John came to a place of understanding that his dear friend was right and he needed to be filled with the Holy Spirit. John then approaching the edge of his cabin bed in prayer surrendered to God's will and was wonderfully filled with power from on high. How many of us come to this crossroad? We have the call, the education, but we lack the power. I have seen many come to this fork in the road of life only to make the wrong decision. Education only is not enough, we must be empowered from above. Upon arriving in India John found himself on the field with three women and one other missionary among one million non Christians. It was time to begin to fulfill his calling and begin to pioneer in a new land. Hyde met a Reverend Ullman who was a missionary to India for fifty five years who taught him about the power of the blood of Jesus. This was a very important foundation for Hyde. 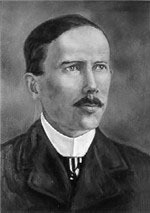 In 1895 Hyde worked with another missionary and a small revival broke out. This caused a great persecution in that village with the new converts being beaten and disowned. This drove John to prayer and intercession. You can just imagine how he felt with those that he poured his heart into being drug out of there homes and being whipped for serving the living God. "And now, Lord, behold their threatenings: and grant unto thy servants, that with all boldness they may speak thy word" (Acts 4:29). In 1896 there were no conversions at all. This greatly disturbed John and he went to prayer to "find the reason." The Spirit of God began to reveal that the "life of the church was far below Bible standards." 1898 Hyde was attacked with Typhoid fever. For seven months he lay sick. During this time his prayer was 1 Chronicles 4:10). "And Jabez called on the God of Israel, saying, Oh that thou wouldest bless me indeed, and enlarge my coast, and that thine hand might be with me, and that thou wouldest keep me from evil, that it may not grieve me! And God granted him that which he requested." In 1899 Hyde began to feel a burden to pray all night. During this time he remembered that the Lord had shown him that the church was far below Bible standards and he took on the burden to pray for others. The more time he spent in prayer the less his fellow missionaries understood him. He was even thought to be fanatical and extreme, yet was willing to be called crazy and face this religious opposition. How many times are people mis-understood who obey God? From these times of intercession, history now refers to him as Praying John Hyde. In 1900 - 1901 Hyde writing home prophetically tells what the Lord had showed him in prayer about the new century. That the new century would be a time of Pentecostal power and a double portion of the Holy Spirit would be poured out. That a great conviction would come and many would be born again. He saw a full apostolic Christianity restored to the church. Hyde believed that a great revival would occur after an understanding of the baptism of the Holy Spirit. He often preached a message, "You Shall Receive Power After." In 1904 Hyde formed a Prayer Group Union for the purpose of 'targeted prayer' for thirty minutes each day. The group prayed for revival, special blessings on the churches, a spirit of unity, guidance, and wisdom. Also in 1904 they scheduled a gospel convention. Thirty days before the meetings they went into all night prayer with fasting, crying out, pleading, and agonizing over the lost. It was at this time that they heard of the revival that had begun in Wales and this caused an increase in prayer and faith for the same. It was this event that "opened the way" for revival to break forth in the convention. Upon seeing the results of a deeper prayer life Hyde gave himself even more to prayer. It should be pointed out that he was not a recluse or a hermit. He was relatable and interacted with others. During this increased time of prayer, he received a revelation of the watchman in Isaiah. "I have set watchmen upon thy walls, O Jerusalem, which shall never hold their peace day nor night: ye that make mention of the LORD, keep not silence. And give him no rest, till he establish, and till he make Jerusalem a praise in the earth" (Isaiah 62:6-7). He would often ask ministers, "Is the Spirit first in your pulpits?" He was referring to John 15, "But when the Comforter is come, whom I will send unto you from the Father, even the Spirit of truth, which proceedeth from the Father, he shall testify of me: And ye also shall bear witness, because ye have been with me from the beginning." Such a Spirit of Intercession was on him that others too would begin to groan in agony for the lost. John's cry was, "Give me Souls, O God, or I die!" Here are some simple facts about Praying John Hyde. He identified himself with the sins of the nation and God's people. He won 4 souls daily himself. He never married. On occasion one could hear him shout to the Lord. He was handicapped with poor hearing. He liked to pray prostrate on the floor. He would pray with people "til." After he was done praying he would clap his hands, dance, shout and was often filled with holy laughter. In March of 1911 he left India because his heart had moved from the left side to the right side. He needed medical attention. He arrived in Carthage Illinois to spend some time with his sister and on February 17, 1912 he died. He was only 47 years old. His last words were, "Shout the Victory of Jesus Christ." His life's desire could be summed up in just a few words. A closer walk with the Lord through prayer, a life of holiness, and to reach the lost.